We will improve your child’s studying skills. Singapore English Math Primary and Secondary Tuition. Small Group Tuition in Singapore with ridiculous improvements in your child’s studying attitude and study skills. Local Singaporean tutors with 2 decades of full time experience tuition centre with PSLE GCE O levels, IGCSE, IB, IP programmes for Local and International students. Expat students from UWCSEA and SAS are our current students scoring distinctions in their examinations. Here’s some photos of our students in class, with examples of how they learn happily and confidently being guided by our tutors. 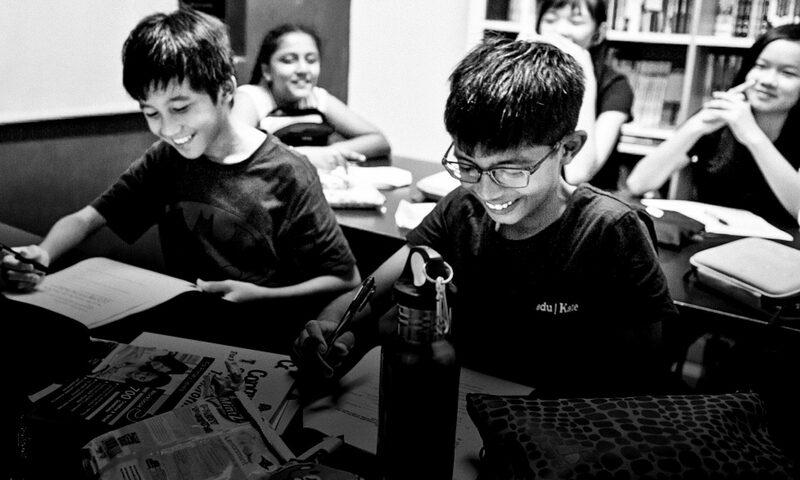 Our Small Group Tuition Centre means all students get the attention needed to improve and they feel comfortable learning in a close knit safe environment. Creative Writing classes with students coming up with different ideas and scenarios before picking one that is the best.